Fire Views | The Happy Wonderer ~ ellen b. As we left Colville on Saturday late afternoon we took our typical driveway shot looking toward Colville. We heard about a new fire north of Kettle Falls that they are calling Boyds Fire. Kettle Falls is north of Colville along the Columbia River. This is a photo from the Lake Roosevelt NPS of the fire in the early hours of Sunday. 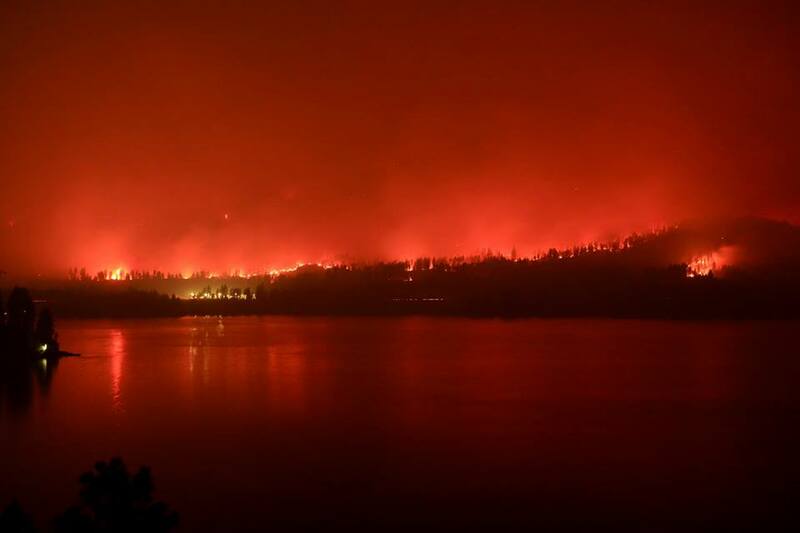 Our DIL’s granny lives across Lake Roosevelt from this fire. Praying things get contained before too long. We are back in the Seattle area again after taking a truck and trailer load of stuff to our kids’ home. Once we got to the eastern side of the Cascades we had smoky skies all the way to Spokane and then north to Colville which is close to the Canadian Border. It was good to have some play time with Addy while Dear and our son unloaded the stuff. She gives such great hugs these days, sweet girl. Our trip home today was clearer and cooler which was a relief. 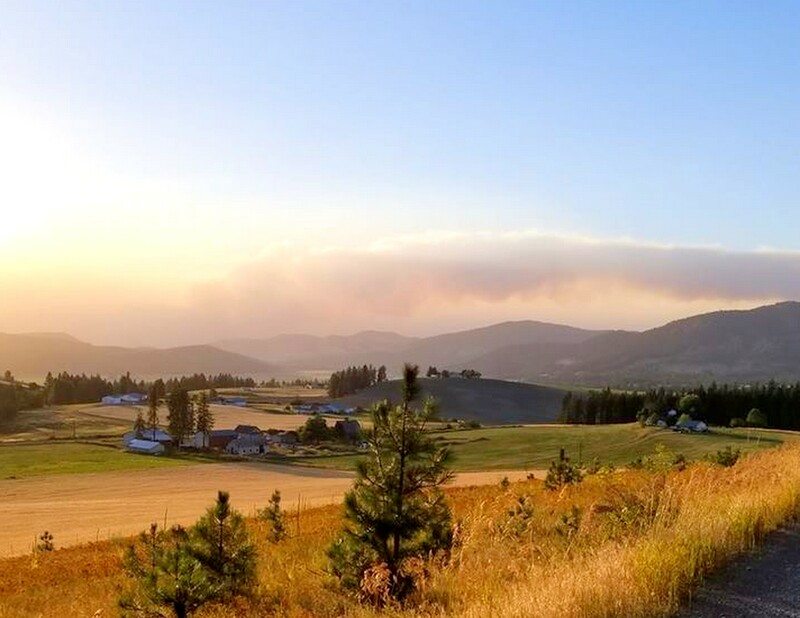 Posted on August 12, 2018 by Ellen •	This entry was posted in Travel, Washington State and tagged Boyds Fire, Colville, Kettle Falls. Bookmark the permalink. The fires seem to get worse each year. The smoke lingers here in Western WA but I’ve been so grateful the smoke is all we have to deal with. I’m glad you got to spend time with Addy! Fire season now seems to be something we can expect as an annual thing in the PNW and California. Wow, that night picture is something. Praying all stay safe. We are getting a whole lot of smoke in Southern Alberta. The wildfires are devastating and happening in many countries. When you can see the fire and smell the smoke the dangerous situation becomes a reality. Praying for safety for all those involved. I’m glad that you’ve been able to store some things whilst looking for a new home and that there was the opportunity for playtime with Addy. …there a certain beauty even in destruction. Hello, the wildfire looks scary. I hope and pray everyone stays safe and the fire is out soon. The smoke must be awful. My sister and niece will be visiting a resort in Bend soon, I think they are worried about their trip from Snoqualmie. Enjoy your day and new week ahead! Oh my goodness this is overwhelming! My own home state of Northern CA is battling tremendous blazes and it is so scary. Prayers to all. Oh, those fires are sooo horrible. I am glad not to live in fire country, even tho most of it is beautiful when it’s not either burning up or mud slides (Calif)….. I am glad for your time with your little girl….Addy is such a cute name. I pray that the fire stays contained and doesn’t spread to where your daughter-in-law’s granny lives. Glad you had less smoke and cooler temps on your way back. Praying. Must be so scary to see that fire so close like that. Makes me thankful for all the rain we have here where I live!! Wow – such devastating fires! Praying for rain and safety to all. Take care Ellen … hope you are not too stressed these days. Those hugs from your little love are the best!!!! Incredible images, Ellen— glad you made it to your destination!